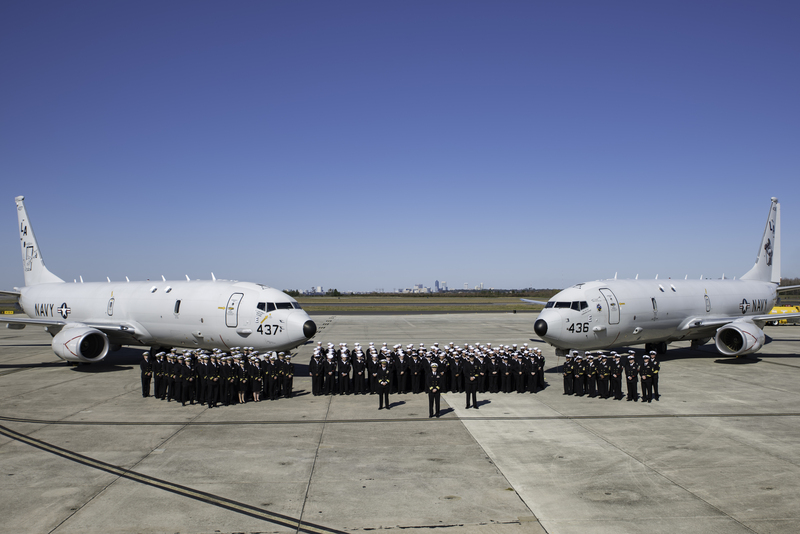 The United States Navy has a proud tradition of mission accomplishment, regardless of the odds. From John Paul Jones taking the fight to the British shores aboard the Bonhomme Richard, to the hard-fought victories of the Pacific campaign, our naval service has been able to find the competitive advantage necessary to win. We have been fortunate that great people throughout our history have risen to the call when necessary. This long and storied list contains names such as Decatur, Preble, Farragut, Morton, Ellis, Puller, Hopper, and Halsey. The right person, with the right answer, at the right time— almost as if fate was on our side. These larger-than-life figures make for compelling stories, but what if they were never born? What if these legends were not in the right place at the right time to save the day? What if the Navy fostered an environment wherein the creative problem solving, critical thought, and extreme ownership that called these legends to action were core competencies across the force? Imagine a force that spends less time prescribing exactly what to do and instead harnesses the power of the collective, a force where our competitive advantage is not simply people, but rather capable, empowered, and passionate teammates. We should develop teammates truly capable of leading us into the future because we are too comfortable reacting to the present. To truly realize our potential, we must deliberately build upon our strong history and shape the ongoing cultural change across the force. We must make creative problem solving, critical thinking, and collective ownership core competencies, and go out of our way to enable teammates who reflect these traits. Our training pipeline and personnel system should reinforce those tenets. In the absence of that, or rather in parallel, we must focus on shaping culture at the unit level. This entails the creation of connective tissue across many efforts that seek the same outcomes to ensure scalability while creating new norms and delivering outcomes we have yet to imagine. In the Design for Maintaining Maritime Superiority, the Chief of Naval Operations lays out numerous lines of effort as a vision and strategy for the Navy’s future. 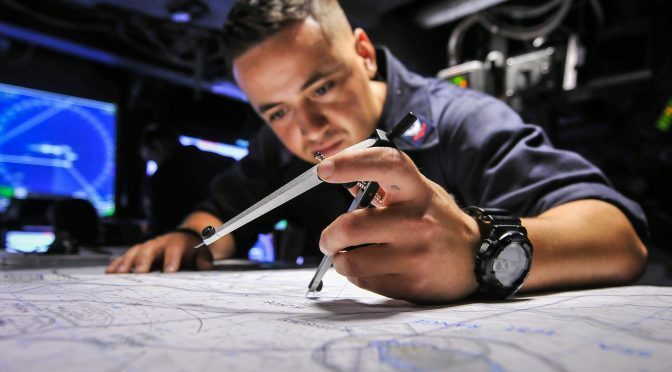 The green line of effort, which challenges the Navy to “apply the best concepts, techniques and technologies to accelerate learning as individuals, teams and organizations,” is being realized in an emerging grassroots movement which has taken the challenge to “set aspirational goals” and use a combination of critical thinking, lessons from history, and methods of human-centered design to encourage creativity and innovation to create advantage. A sustainable competitive advantage is difficult to identify, and often results from an interwoven mass of tangible and intangible factors. Tangible resources are easy to identify and range from financial capital to physical assets like airplanes and ships. Intangible resources, while more difficult to quantify, may be the most valuable assets that an organization possesses. Human resources provide long-term exploitable skills, productive effort, and tacit knowledge that is difficult to replace and hard for competition to replicate. Personal and organizational experience builds tacit knowledge, and can be described as the collective know-how of a group. Organizations often struggle to quantify or pass on this knowledge through verbal or written communication. In order to prevent stagnation, the Navy must become a learning organization. A learning organization continuously transforms itself by properly unleashing its people’s tacit knowledge. Throughout the rich history of the Navy, innovation and creativity have often ebbed and flowed. As Peter Senge points out in his book The Fifth Discipline, many successful learning organizations share a common vision, willingly challenge their own mental models, and encourage their people to seek personal mastery and engage in team learning. The results are the Googles, Facebooks, Ubers, and Warby Parkers of the world. This is not to say the Navy should model itself in the image of Facebook or Uber. Clearly the business model of fighting and winning our nation’s wars differs from that of social networking or crowdsourcing vehicular transportation. 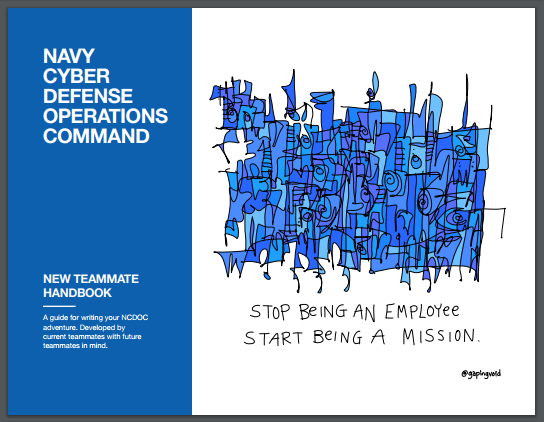 But just as many different corporations with different goals and models have embraced rapid learning to achieve maximum possible performance, so too can the Navy, and the first step in becoming a learning organization is admitting that you are not one. Though many senior leaders may disagree, our Navy, as a whole, is not a true learning organization–at least not yet. Everyone needs to grow comfortable with a continuous departure from the status quo as the start of a new way of thinking. Through the combination of these ideas, an organization can leverage the knowledge and abilities across the spectrum of its constituents. The core competencies of creative problem solving, critical thinking, and collective ownership will help us break this mold. Our current system fails to assess, develop, or value these competencies. But unbeknownst to many, a deckplate revolution has commenced. This revolution continues to bring smart creatives from across the Navy together to create a movement. They focus on reimagining our culture as one founded on the aforementioned core competencies. This is where design thinking comes into play. Much contemporary writing focused on change references design thinking, but what is it exactly? 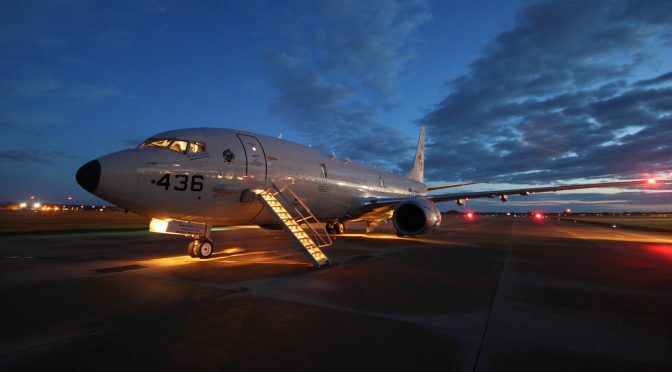 Is it a perceived silver bullet from industry that the military is attempting to latch on to? A fleeting “buzzword” quickly forgotten? Hopefully not. Design thinking is about embracing the combined knowledge within an organization for maximum possible performance. Creating solutions can be difficult, especially if you have not effectively defined the problem. Design thinking provides a process to focus efforts and achieve results. Though many techniques and tools differ, design thinking is rooted in four major elements: define the problem, divergent thinking, convergent thinking, and refine/execute. Defining the problem is very easy to gloss over, but it can be the most important step. Are you solving the right problem or simply a symptom of a higher systemic impediment in your organization? Design thinking encourages approaching the problem from different perspectives to ensure you are still solving the correct or complete problem. Seek to ask why until you have worked past the easy answers and get to the truly hard question. Don’t just look for the simplest and most obvious solution, but seek as many different solutions as possible. Divergent thinking facilitates this concept, especially with many people working together. The goal is to diverge into as many ideas as possible, where the most opportunities appear when you are not constrained by finding the “best” solution. Think quantity over quality; many people can’t arrive at the right answer without fully embracing their comfort in the group or without pulling ideas from previous ‘bad’ examples. After generating as many opportunities as possible, design thinking uses tools to group, merge, and then pare down the solutions until, through synthesis, converge on the best functional results. To higher leadership, this can be considered a catch-all in removing the ‘Good Idea Fairies’ from the group and allowing the best solution to bubble to the surface. This solution will be free of emotion and carries with it a vector towards positive change. After arriving at a solution, seek refinement and development through basic prototyping. Design thinking provides tools to prototype solutions that seek to test the foundations of the idea rather than building a working physical product. This enables testing and further development with minimum resources. For higher levels of leadership, this may work towards an entire command or unit. When implemented from the ground-up – individuals, workcenters, divisions, and departments – this equates improvement across the spectrum. After the solution has been refined, execute. Ideas without execution are meaningless. It takes action to bring an idea to fruition, and without that action, design thinking is truly just the latest “buzzword” spoken in an echo chamber. Upon the conclusion of the event, the collaboration and support of the participant’s leadership is necessary to promote the success of these young leaders by providing them with time, trust, and top cover. These core aspects drive the successful engagement of our young Sailors and Marines, and inspire every ounce of our commitment and progress. Without them, we don’t have the perspective to see beyond our silo of thought. The relationship between leadership’s time, trust, and top cover and rank and file empowerment defines the success or failure in the leader-led relationship. All of the time and trust in the world does nothing if you don’t have someone blocking for you along the way. Conversely, there is no top cover that someone can give you that would produce results without the adequate time and trust that goes along with it. 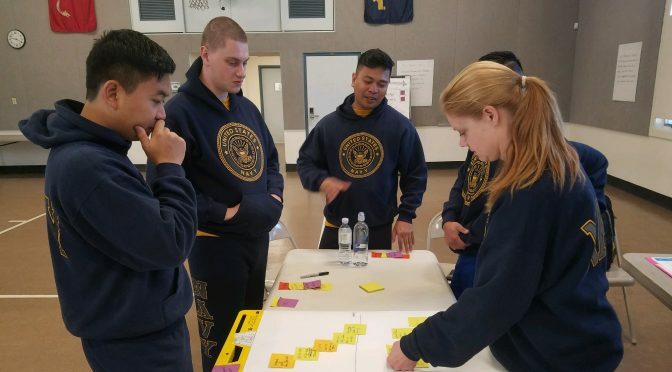 The illuminate initiative at Fleet Forces Command is one grassroots program bringing design thinking courses to Sailors and Marines. Turning the traditional paradigm of learning on its head, they encourage shrugging off bureaucracy, taking ownership, and focusing entirely on problem-solving and process improvement as opposed to passively receiving top-down innovation initiatives. Based in the concepts of design thinking, the Th!nkshops seek to identify solutions through a process of divergent and convergent thinking, coupled with the critical thought and positive mindset vital to the process itself. Like many other organizations in this grassroots movement, illuminate champions the fact that the foundations, objectives, materials, and format are designed and taught by a small team of active duty Sailors and Marines. Led by a passionate group of individuals, the course has already made a difference across the Navy. These efforts have primed the pump of an ad-hoc network of like-minded Sailors and Marines that seek to collaborate and achieve results. 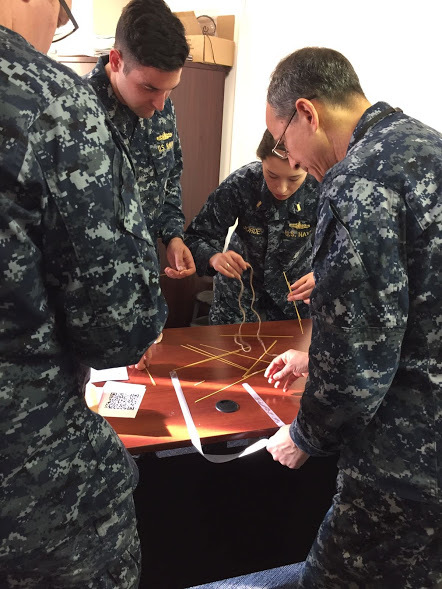 With the right resources and an expanded inventory of design thinking and organizational learning methods at their disposal, this network could move from an ad-hoc group of facilitators to a connected group of command sponsored representatives that will achieve maximum performance across the Navy. Getting the Th!nkshop pilot off the ground would not have occurred without an incubation phase. Illuminate needed people to iterate and a laboratory to experiment in order to refine the course. Enter Navy Cyber Defense Operations Command (NCDOC). The Echelon IV command participated in numerous iteration sessions and helped develop the Th!nkshop curriculum. Throughout this process, NCDOC personnel received personal and professional development training and provided candid feedback to the illuminate facilitators. The USFFC Th!nkshop facilitators refined the course based on the feedback. This cycle of iteration, development, and growth continued for several months. 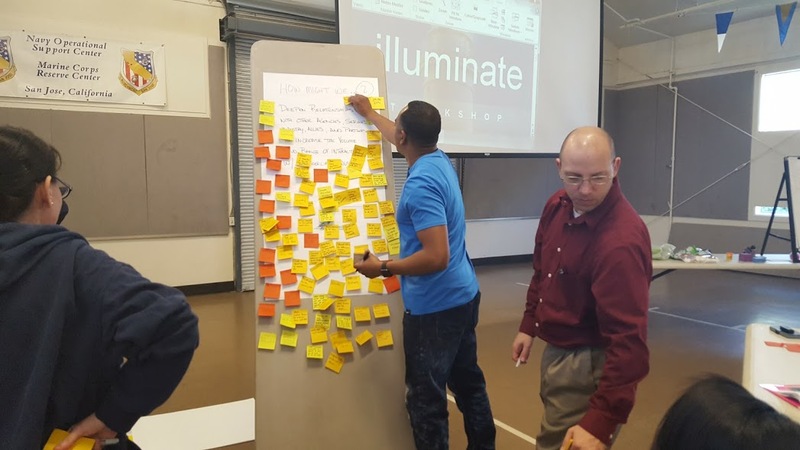 As a result, NCDOC adopted and launched its own chapter of illuminate utilizing their own in-house facilitators, while USFFC simultaneously began to spread illuminate across the naval enterprise. Since leaving NCDOC in December 2016, USFFC has impacted numerous commands. These include more than 40 commands at Seventh Fleet (C7F), Space and Naval Warfare Systems Command (SPAWAR), Southwest Regional Maintenance Center (SWRMC), and Naval Operations Support Center (NOSC) San Jose. They are scheduled to travel this summer to NOSC Dallas, East and West Coast Submarine Forces, SWRMC, and SPAWAR. They also conduct a series of Th!nkshops in Norfolk where they have trained Naval Expeditionary Combat Command (NECC), Fleet Readiness Center Mid-Atlantic (FRCMA), National Guard, Reserve Forces (RESFOR), and Naval Information Forces (NAVIFOR); summer plans include OPTEVFOR (Commander Operational Test & Evaluation Force), Transient Personnel Unit (TPU), Explosive Ordnance Disposal Mobile Unit (EODMU) 12, and Special Boat Team 20. NCDOC’s support and assistance provided the fertile ground for the Th!nkshops to blossom from an amazing idea to a training mechanism directly impacting Sailors and Marines. Their partnership laid the foundations for illuminate to scale across the fleet. The time, trust, and top cover of a trusted ally provided the fertile ground for the illuminate Th!nkshops to grow and develop. In its early phases, illuminate took root at Navy Cyber Defense Operations Command (NCDOC). But long before opening their makerspace for Th!nkshop incubation and refinement, NCDOC began a deliberate culture shaping journey. A journey as unique as their mission; one that continues to make them the Navy’s “Purple Cow,” to borrow a term from Seth Godin. They don’t use a Command Assessment Team to assess climate, they have a Culture Club that shapes culture. They use a 360-degree hiring panel to select new civilian teammates, and conduct 360-degree feedback for all E-7 and above as well as supervisory civilians. They have shaped a culture that truly combines the power of the 21st century mindset with the best of our strong Navy tradition. The foundational experience among NCDOC Teammates is their tailored version of the illuminate Th!nkshop, which is integrated within their 100 Day Onboarding process. Over the last few months, the Th!nkshop alums have reinvented peer recognition, reimagined mentorship using the NFL draft as the model, developed a locator tool to navigate their building, crafted a New Teammate Handbook using Valve’s New Employee Handbook as inspiration, redesigned their next Command Climate Survey, and directly leveraged design thinking to reorient operational execution. The most visible evidence of the significant culture shift at NCDOC is the aforementioned New Teammate Handbook. It not only serves as a vehicle to reinforce their ongoing commitment to culture-shaping initiatives, it also serves as an example of how the public sector must both lead and engage if they are to give Smart Creatives reason to join the team. NCDOC serves as a visible example that it’s not about the Th!nkshop itself; it’s about the culture it fosters and the operational outcomes that a culture of creative problem solving, critical thinking, and collective ownership generates. 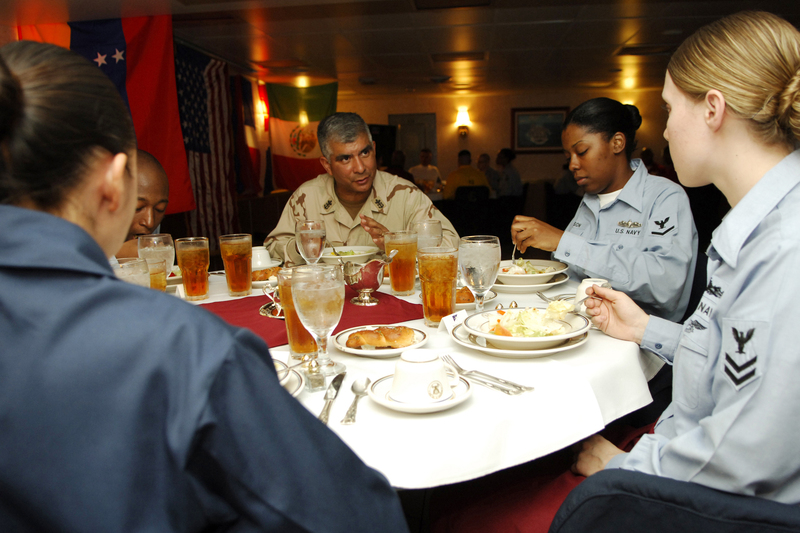 The NCDOC team interacts differently than any other within the Navy. Their spaces are different from any other within the Navy, and their approach to just about everything is different from any other within the Navy. It’s not about being different for the sake of being different, but rather about caring enough to question everything, to allow expertise to trump rank, and to prioritize long-term significance over short term success. NCDOC is a prime example of how a sustained commitment to facilitating Th!nkshops impacts thinking, doing, and mission accomplishment at the unit level. A Th!nkshop experience may leave you inspired to do more, but without the visible commitment to the tenets it teaches by leaders at every level, you will quickly be reminded of the short shelf-life of inspiration. The work at USFF and NCDOC is not Navy-mandated, but simply the result of some forward-thinking minds within the Navy and Marine Corps, the desire to make a difference, and the opportunity to do so. Th!nkshops have inspired many, but we measure impact by our ability to sustain and scale the transformation ignited to date. Th!nkshops alone won’t generate the outcomes we need; command triads committed to culture shaping and helping each teammate realize their potential will. We offer our Th!nkshops as a vehicle to kickstart local initiatives, and welcome the opportunity to partner with units across the Navy. These partnerships grow and strengthen our network of leaders committed to creating an environment that affords us the opportunity to evolve into a true learning organization. This environment not only ensures great ideas are prevalent, but as our Chief of Naval Operations has made clear, allows us to turn those ideas into something real. Contact us below for more information on how you can be a part of the Th!nkshop movement. LCDR Owen Morrissey and LT John Hawley are currently assigned to USFFC in support of the CNO’s Design for Maintaining Maritime Superiority. They can be contacted at owen.morrissey@navy.mil for executive engagement and john.w.hawley@navy.mil for more information and to schedule an illuminate thinkshop. For more information on the NCDOC state of mind, contact Dr. Rebecca Siders at rsiders@ncdoc.navy.mil. My challenge to the Fleet, the Navy, and the rest of the Department of Defense is to not just seek out “innovation.” For many reasons, just seeking out innovation is not enough. I challenge the fleet to be “deliberately innovative,” taking deliberate steps to drive innovation and change into the organization. One way we at the SEVENTH Fleet Innovation Team are accomplishing this is through “Illuminate Thinkshops” presented by Leadership, Equality, and Diversity (LEAD). These workshops were held in conjunction with the U.S. Fleet Forces Green Team at Atsugi, Sasebo, and Yokosuka Naval Bases from January 23 – February 3, 2017. The Thinkshops reached over 2,000 Sailors, Marines, and Navy civilians stationed in Japan. In addition, Command Triad Thinkshops “illuminated” over 150 command triad members on how to deliberately lead and support a diverse organization of problem solvers. Innovation can not survive without top cover and support of the chiefs and officers in charge of the organization. The actual key to success of deliberate innovation in SEVENTH Fleet, however, is the creation of the Fleet Innovation Network (FIN). The SEVENTH Fleet FIN is a key node in the SECNAV’s Naval Innovation Network. It is made up of the more than 170 Command Innovation Facilitators we trained through the Illuminate Thinkshops. These Facilitators will be a place potential innovators can to go for guidance, mentorship, and more importantly, to connect with other facilitators in the network. Below, I will discuss some of the thoughts I had as we organized the Thinkshops and discussed the role of innovation in the Navy and at SEVENTH Fleet. For more info on the LEAD Presents: Illuminate Thinkshops, go HERE, HERE, HERE, and HERE. Innovation is all around us. This morning, I poured a bowl of innovative cereal. My computer, it’s innovative. The last brief I received on a future military weapons system – innovative. Innovation is an easy buzz term. “My product isn’t just new, it’s innovative!” I hate to break it to my cereal company, but when everything is innovative, nothing is. The term innovation has been so misused it has started to lose its punch. Innovation has become synonymous with “new.” As many of us can attest, new things are not necessarily good things. I feel frustrated because innovation isn’t just about new things, it is about new things that may bring a strategic advantage. As the Fleet ages one more year, it is increasingly obvious that we need the right new things to replace outdated equipment or we will continue to fall behind potential adversaries. To gain back our strategic advantage, we need to bring real innovation. That means we need to deliberately shape how and, more importantly, who does innovation in the Navy. Innovation is not just getting the right things. Innovation is also about controlling the processes we use to get the effects we want. We have layers upon layers of regulation, rules, and processes that are out of date, wrong, or just plain inefficient. In order to do what we need to do, at the time of our choosing, we need to control the processes we use. In some cases, this means changing or rewriting our rules. Rules and regulations should aid us instead of standing as barriers. Largely, we should first look at removing the barriers to innovation completely, which means eliminating entire sets of rules and regulations. We own the process; we need to stop acting like the process owns us. To take back ownership, the Chief of Naval Operations has challenged the Navy in his “Design for Maintaining Maritime Superiority” to implement high velocity learning. The high velocity learning concept was influenced in part by a book by Steven Spear, The High Velocity Edge. High velocity learning is not just about learning faster, but it is about the learning that is associated with becoming an organization that can sustain its advantage over others. Steven Spear calls an organization that is able to continually maintain an edge over its competition a “high velocity organization.” A high velocity Navy will be able to sustain its advantage over potential adversaries. A high velocity organization is organized and empowered to rapidly identify problems and inefficiencies and fix them. In today’s Navy, eliminating variation often feels like the primary business of the entire organization. In a high velocity organization, when a problem is identified, the entire organization must swarm on the problem and solve it. This often means rapid and dynamic changes to the organization. High velocity organizations are intolerant of workarounds, but are tolerant of failure that helps them improve. In the Navy as it is today, change is minimized and failure is verboten. In a high velocity Navy, change is embraced and failure is a part of the process. Problems are identified and solved by the whole organization. When the organization identifies problems, the solution is often real innovation – either a technological solution, or a modification to an existing process. A key aspect of high velocity organizations is they share the solutions they have learned widely and at all levels. When a problem is identified, the organization puts all of its resources behind solving the problem. This is the essential part of high velocity learning. The organization itself must be able to take advantage of all the ideas it is capable of creating, implement them, and share them widely. To do this, it must be deliberate in seeking out inefficiencies, developing innovative solutions, and implementing them. Innovation doesn’t happen by accident. Why don’t we as an organization embrace high velocity learning and innovation as the drivers of a high velocity organization? That is a complex question, but ultimately, Navy and Department of Defense cultures do not support it. What is it about our culture that prevents the deliberate application of innovation? In the late 1980s through the early 2000s, the Navy focused on Total Quality Management and Lean Six Sigma. These management theories sought to eliminate all risk in processes through the implementation of controls and data-driven management. As a result, large organizations were developed to measure, test, and evaluate performance and to mitigate risk. Initially, costs went down as we eliminated waste. Workplace injuries and work defects declined considerably. These were largely successful programs that helped the core business of keeping ships, submarines, and aircraft afloat and maintained. However, the same risk mitigation processes were hostile to innovation. Innovation, by its nature, will disrupt the status quo. It can be evolutionary, like the spiral development of a weapons system, adding features systematically. Sometimes it is revolutionary, making an entire section of Navy business irrelevant. Implementing an innovation is disruptive to the core business of the Navy, and so, under Total Quality Management and Lean Six Sigma (as practiced by the Navy), innovation is a risk to be mitigated. Failure of a system within the core business is to be avoided, even if the system is out-of-date or inefficient. The system is designed to mitigate all risk to the system, even that risk that is beneficial. Compare this to a common mantra in the startup culture often associated with Silicon Valley. Silicon Valley businesses are encouraged to: “Fail Early, Fail Often, Fail Cheap, and Learn Always.” This philosophy allows tech businesses to rapidly iterate through successful and unsuccessful trials of new ideas. Businesses mitigate risk by creating minimum viable prototypes and testing them in operationally relevant environments. They further develop successes, and learn from, celebrate, and discard failures. The Navy needs both systems: one system that mitigates risk in the core business, and another that accepts risk as a part of development. We must be conscious of the risk to our core business of bringing in new innovation, but also be hostile to the core business practices that are maintained simply to mitigate risk. We need to iterate faster than our adversary, and so, we need to build a culture that can appropriately evaluate, accept and celebrate risk. The Navy has a similar problem. Add this to the number and priority of collateral duties required for promotion, as well as command-sponsored fundraising events, mandatory fun events, and community outreach. Then, add boards, qualifications, watch, professional development, and if you’re lucky, family time. Innovation and process improvement requires time to think, pause, and evaluate if the processes we are using are relevant, efficient, and right. Implementing innovation is disruptive and has a bureaucratic cost to it. It may even have a short-term mission cost. For a watchfloor with limited personnel to implement a major training initiative, it may mean standing down the watch for a little bit of time. The culture of the Navy is biased against stopping operations to implement improvements, even if the improvements will save time overall. A high velocity organization does not have time to waste on efforts that do not move the organization forward. A high velocity organization is not afraid to stop unnecessary efforts and remove inefficient processes. In business, this is how a high velocity organization stays ahead of the competition. For the military, eliminating bureaucratic bloat and focusing on warfighting effectiveness is how we prevent, and if necessary, fight and win wars. And so, here again is where deliberate innovation comes in hand. The organization must have the ability to identify wasteful work and eliminate it. It must provide time for thinking, reflecting, and rest. A culture of busy-ness isn’t a sign of a healthy organization. It is a sign of an inefficient one. Innovation must become a priority, because a culture of innovation is the only thing that can overcome a culture of busy-ness. A culture of innovation is a culture with a job to do. When we talk about innovation, there is a temptation to make the claim that we should all be innovative. In reality, an organization filled with only innovators is as ineffective as an organization with no innovators. For every innovation, there must also be a group of people able to transition the innovation and sustain it into the core business. 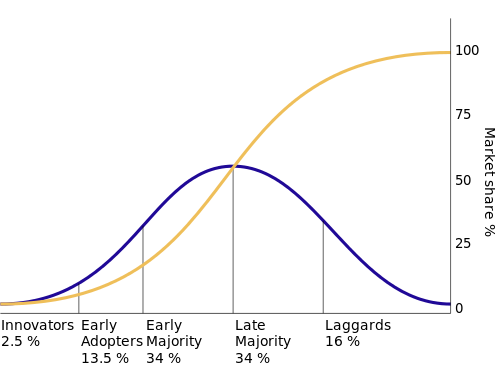 In his 1962 book Diffusion of Innovations, Everett Rogers describes the diffusion of innovation as a bell curve, breaking up the population based on their tendency towards innovation. The first half of the curve includes the Innovators (2.5%), and the Early Adopters (13.5%). The bulk of people fall into the Early Majority (34%) and the Late Majority (34%). The last group is the Laggards (16%). While there has been no specific study to prove it, we can assume that the distribution in the Navy approximates the general population. Those who may identify, and act as active innovators within the organization will only make up between 2.5%-10% of all individuals. The rest of the group will (and should) focus on the core business aspects of the Navy. Inevitably, those who challenge the status quo will run into problems in the military. They are a minority within a system that works to minimize variation within the organization. In addition, to gain access to the resources and sponsorship necessary to implement their innovation, they often have to interact at very high levels in the chain of command. This creates risk in the perception that the innovator is skipping the chain of command, especially for junior enlisted personnel. One of the best analogies to being an innovator within the military is like being an organ in an organ transplant. The innovation organ is necessary for the body to function, but the body identifies it as a foreign body and attacks it with antibodies. Without support and suppression of the antibodies, the organ will very likely be rejected, and probably harmed in the process. Being an innovator is hazardous work, and so we often see innovators leaving the service early, further diluting the distribution of innovation in the higher ranks. The solution is to build a culture that is capable of supporting the innovator, while protecting the core body. The difference between an organ transplant and a tumor is purpose and intent, and so an innovator must be given both purpose and intent. This has to occur at all levels of the chain of command. I recommend creating a “golden triangle” in order to drive innovation within an organization. First, you need a young-minded innovator. Innovation holds no age or rank, but is an attitude associated with youth. Innovative minds have a higher propensity to take risk and a greater resiliency to failure. Second, find a senior mentor or “greybeard.” This person provides top cover for the innovator, advice, and knowledge of the system. In addition, senior mentors are often connected to resourcing for innovation. The senior mentor’s primary job is to protect the innovator from antibodies, and to remove barriers to innovation. The senior mentor also reduces risk to the system as they can properly direct the innovation to minimize disruption to the core business. The senior mentor is often the Commanding Officer of a ship or Flag Officer with access to resources. Third is the technologist or policy guru. This is the person who can take the idea and put the technological and policy rigor behind it so it can fit into the system. A common mistake made in innovation is to transition the idea from the young-minded innovator and transition it wholly over to the “expert.” Because of the diffusion of innovation, it is very likely that the technologist or policy guru is not an innovator or early adopter. In fact, it may be desirable that the technologist is not an innovator or early adopter. The technologist is the immunosuppressant that ensures the body can accept the innovation. A high velocity organization isn’t just about innovation, nor is it about the innovator. It is about building an organization that can support innovators and innovation as a driver for the high velocity organization. This requires the entire organization – both innovators and supporters – to be involved. To build a high velocity organization, the entire culture must be positioned to support innovation and innovators. In order for a culture that supports innovation to take off, the Navy needs to develop more Casey Deans. The Navy needs more Tummlers to support our innovators. Innovation within a bureaucracy as large as the Navy and the greater Department of Defense does not occur spontaneously. It exists behind the scenes. Without a deliberate attempt to bring innovation to the forefront, innovation will continue to occur as the exception to the norm, instead of as a core part of our business. We cannot address innovation without addressing the Navy culture. It is not enough to wait for other organizations like the Office of Naval Research or the Systems Commands like NAVSEA, NAVAIR, or SPAWAR to deliver innovation to the Fleet. No, the entire Navy, the Fleet, each command, and each individual, must deliberately be aware of innovation as a driver of change. We as a team must set the conditions for the organization to accept and transition innovation, and we must protect innovators as the valuable, low-density resources they are. We also cannot think of innovation as an island unto itself. We must drive towards being a high velocity organization, following the Chief of Naval Operations’ vision of implementing high velocity learning at all levels. This means identifying ideal processes, being intolerant of inefficiencies and workarounds, swarming to bring forward solutions through innovation, and then sharing the knowledge broadly across the entire enterprise. This is an all hands effort. We have to be willing to experiment, be unafraid of failure, and iterate quickly on our results. This is just the first step. 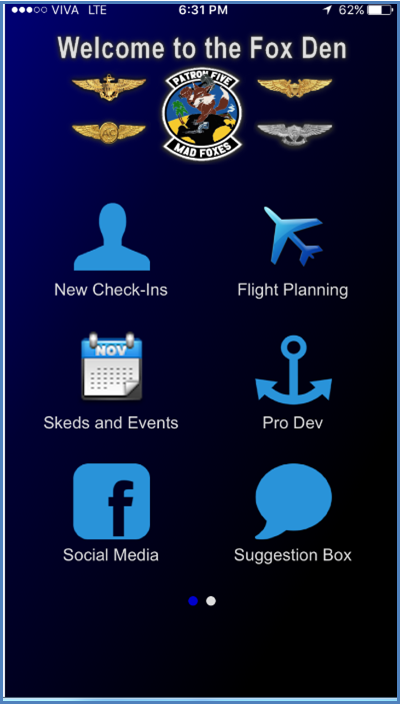 Next, we hope to stimulate the Fleet Innovation Network to begin driving their own events, to identify issues in their own commands, solve them, and share them. We will build the Fleet Innovation Network over the next year, and we will highlight our failures as brightly as we do our successes. This is what being deliberately innovative is. It is a culture of continuous improvement that drives our organization its highest velocity and to achieve its highest potential. We are not there yet, but we are taking the first steps. LT Jason Knudson is the U.S. Navy’s SEVENTH Fleet Innovation Officer. He is passionate about innovation, design thinking, and the unbridled potential of connected human beings. Contact him at lead.c7f@fe.navy.mil. Thoughts and ideas are his and do not necessarily represent those of the Department of Defense, Department of the Navy, or SEVENTH Fleet, however he hopes they will. External links are for reference and are not meant to be an endorsement by the above organizations. Join the conversation at facebook.com/navyleads and on twitter @navyleads. On a recent Wednesday evening, fifteen midshipmen gathered in the company of a Maersk captain and a handful of Navy officers of all ranks. Their roles in the hierarchy seemed clear. However, over the course of two hours, dynamic exchanges about piracy, leadership at sea, and market efficiency had everyone on the edge of their seats. Conversation flowed freely between the experienced and the novice, and across a wide spectrum of professional interests. By the end of the night, what was left was simply a group of people eager to learn from one another. What happened? High velocity learning. CNO ADM Richardson discusses his vision for a Navy that embraces High-Velocity Learning. Credit: Naval Post-Graduate School. The Navy recently issued a Design for Maintaining Maritime Superiority in which Chief of Naval Operations (CNO) Admiral Richardson outlined an effort to “achieve high velocity learning at every level.” What does that mean? The concept of high velocity learning challenges us to reinvigorate a culture of assessment and strive to increase the speed of our learning cycle. This seems to have been confusing to many in the Fleet, especially for those of us many rungs down the ladder from the CNO. How can we implement his guidance? Once a month for the past two years, a group of fifteen midshipmen, some junior officers, a few senior officers, a senior enlisted leader, a handful of civilians, and one discussion leader have piled into a living room for a conversation. Hosted at a senior officer’s home after hours, “Unplugged” is something different. It is a casual venue for focused dialogue and exchange of ideas. In the past two years, our discussion leaders have included an executive from the Office of Naval Research (ONR), the Mayor of Annapolis, a Maersk captain, submariners, and astronauts. “Unplugged” brings together people from different circles, with different levels of experience, and those who would not usually interact. The speakers are experts in their fields. Spots for participants are first-come, first-serve with no expectation of subject matter expertise. Officer and senior enlisted participants facilitate discussion of Fleet applications. These key tenets of making conversation a success can be applied at any level and in any command that wants to engage its Sailors: dialogue, setting, and spectrum of experience. Midshipmen, more than many others, are afforded visits from former Presidents, Ambassadors, and senior executives. We crowd into Alumni Hall and, frankly, decide in the first five minutes of a presentation how much effort we will put into staying awake. What makes “Unplugged” special is the personal interaction. We listen to a speaker with years of expertise and then are asked, “What are you thinking?” It forces us to be inquisitive and thoughtful about the topic at hand. Participants leave with an opinion on the topic, a problem with which to grapple, and more questions than could be possibly answered in a two hour session. Processing new and challenging information while developing a questioning mindset are skills necessary for all future officers. 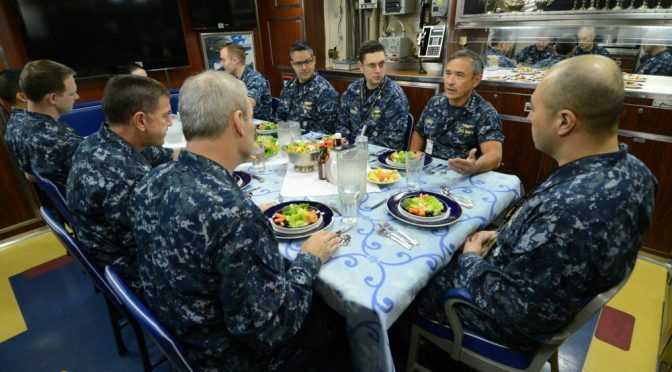 The atmosphere created by a home-cooked meal in a living room takes midshipmen and senior attendees alike out of the monotonous classroom or lecture setting. It makes the event informal; there is less of an expectation to be taught a subject and more of an inclination to engage in discussion. This setting is effective at the Academy because the home-cooked meal is so rare, but this could be implemented anywhere that takes the attendees out of their normal environment. It is also invigorating to sit down next to a Navy commander and share ideas and excitement about the night’s topic. As the discussion leader wraps up his or her points to start the discussion, there are no fewer questions from the senior attendees than there are from the midshipmen. Because of the range of experience, input can come from every possible interest in the room. 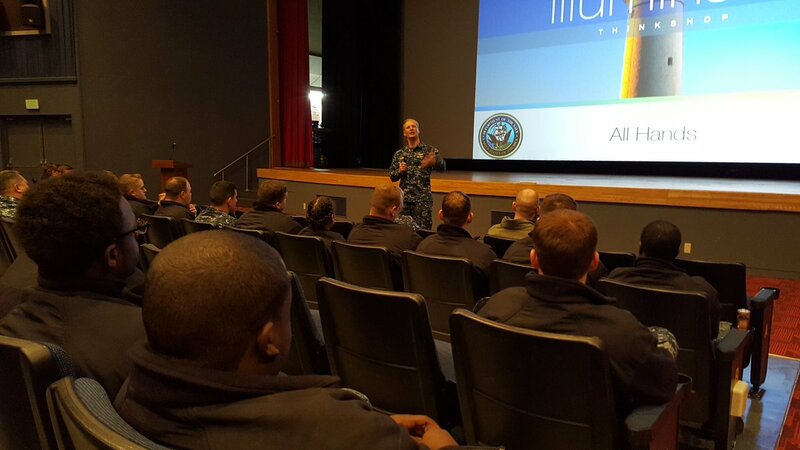 This dialogue gives the speaker, midshipmen, and senior attendees a chance to relate the topic to their operational area, and to express both praise and critical questions. Senior and junior officers at “Unplugged” use their experiences to invaluably relate the discussion topic to how we fight and operate in the Fleet. This leads to more conversation, spreading from class, to company, to the Brigade. Those who are most engaged, most thoughtful, and most inquisitive are invited back to help lead the next conversation. Walking out of an “Unplugged” event, participants are buzzing with ideas. They are energized about their futures and are itching to continue the conversation. Participants all interact with people whom they thought were out of reach. But in these challenging conversations with senior level experts, their ideas and questions are entertained, explored, and given credence. The “velocity” in High Velocity Learning implies both a speed and a direction. We incorporate not only an energizing discussion, but also seek an endstate. At USNA, our endstate is getting as many midshipmen involved as possible, building confidence in them to engage in these discussions, and encouraging the thoughtfulness to ask more challenging questions. 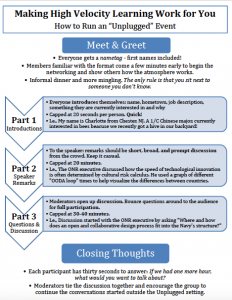 After “Unplugged” with the ONR executive, we asked, “How does the Navy’s risk calculus affect its ability to innovate?” After the Mayor, we asked, “What can we learn from local leaders about how to manage a team?” After the Maersk captain, we asked, “How might we work better with our commercial shipping counterparts?” Every participant offers unique value to the discussion. We have taken Big Navy’s objectives to heart and made them successful on a small scale. To us, high velocity learning means a problem solving mindset. It is the ability to frame the problem, evaluate what we do and do not know, and devise and act on a way forward. “Unplugged” is a forum through which we develop this method of learning. The goal is to continue the momentum of the conversation and spread the excitement about thinking, reading, and discussing relevant challenges to the Navy team. As midshipmen, we often do not have access to these conversations that are so critical to our future careers. It isn’t that we lack interest, but rather some discussions are not accessible to us or we don’t know where to look. “Unplugged” bridges this gap and gives midshipmen confidence and access to the dialogue. Try it within your peer group. We guarantee you will walk away invigorated and ready to continue the conversation. This is high velocity learning. Charlotte Asdal and Scotty Davids are both first-class midshipmen at the U.S. Naval Academy. Charlotte is studying Chinese and from Chester, NJ. Scotty is a mechanical engineering major from Boulder, CO.